Gleaners? relatives, ancestors of collectors? You are here: Home / Books etc / Collecting in pop culture / Gleaners? relatives, ancestors of collectors? AGNES VARDA’S TWO FILMS ABOUT GLEANING – originally gathering the useful remnants of the crop after harvesting) are being screened in Melbourne on Sunday 13 July at 2.30 pm and 4.15 pm at the Australian Centre for the Moving Image, Federation Square, Melbourne. They may be of interest to collectors interested in the idea of collecting. While the starting point is foraging for food, there are references to collecting other types of leftovers of modern life. 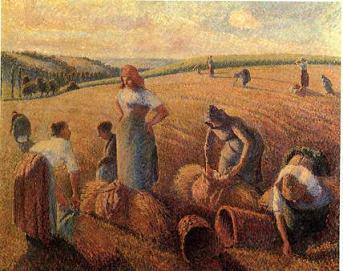 A response to Millet’s painting The Gleaners which inspired Vargas’ interest in the concept. The film tracks a series of gleaners as they hunt for food, knicknacks, thrown away items, and personal connection. Varda travels the French countryside as well as the city to find and film not only field gleaners, but also urban gleaners and those connected to gleaners, including a wealthy restaurant owner whose ancestors were gleaners. The film spends time capturing the many aspects of gleaning and the many people who glean to survive. One such person is the teacher named Alain, an urban gleaner with a master’s degree who teaches French to immigrants. Did gleaners morph into tip scroungers over time. My great Uncle George Crawford lived in North Melbourne in a small low ceilinged worker’s cottage. He scrounged the North Melbourne tip and had a treasure trove of goods in his back shed! This would have been the early 1960s that I remember. When we visited he would let us take one item. I remember flat tinplate printed sheets with ads and lids for things like boot polish tins, shotgun ammunition, piles of cutlery and more. The tinplate sheets would be fantastic now but sadly long gone. My best item was a buggy whip that I terrorised the geraniums with. On the same day my cousin was given a wooden bowling pin. He is still upset that I got the whip. Now I think back Uncle George’s shed either started me off as a collector or established my latent collecting passions.